You know that every Wednesday whether I’m home or away I NEED to be part of a unique party… What I Ate Wednesday the fabulous brain child of the lovely Jenn from Peas and Crayons. It’s the most fun you can have sitting in front of your computer. Be sure to make the trip over to P&C when you’re finished here. As she’s been doing for a while, Jenn is giving us themes…Which I like! Now seriously…I’m always moaning about trying to stay away from snacking so I’m miserably unprepared for this. However, since I have all of June to deal with it, I’ll work with what I have and start here. Regular food mixed with snacks and regular food that is Great as a snack! 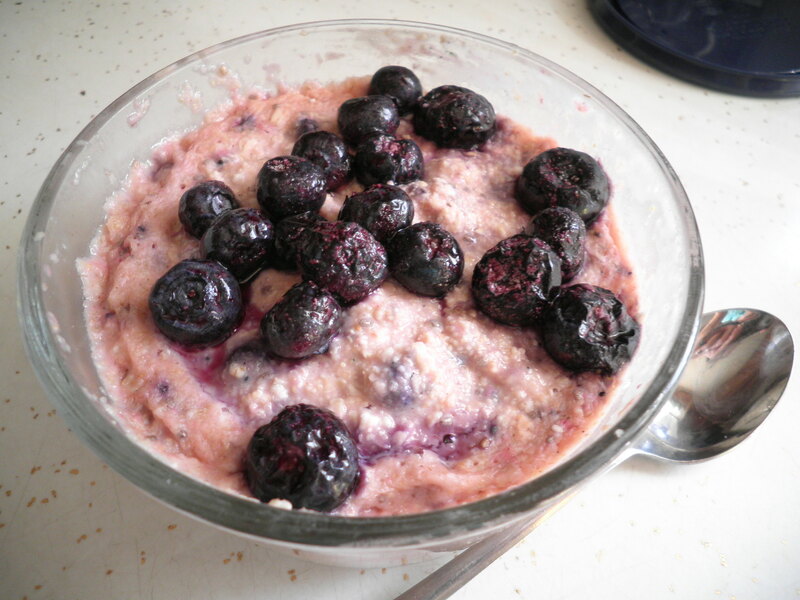 Overnight oats with blueberries and cream Spiru-tein mixed in topped with fresh frozen blueberries. So delicious and filling. This could work as a snack. 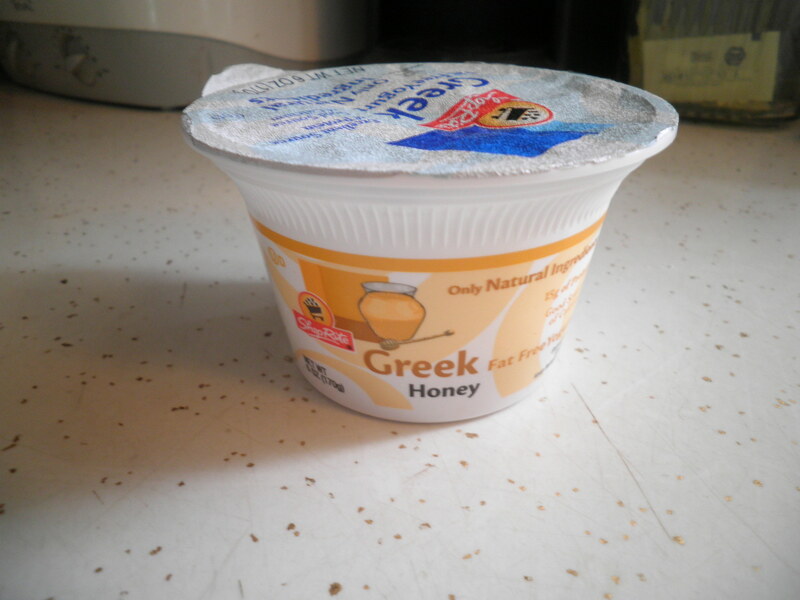 Greek yogurt with honey…sometimes breakfast, sometimes lunch, sometimes a snack! I love this brand and it was on sale yesterday…Ok by me! 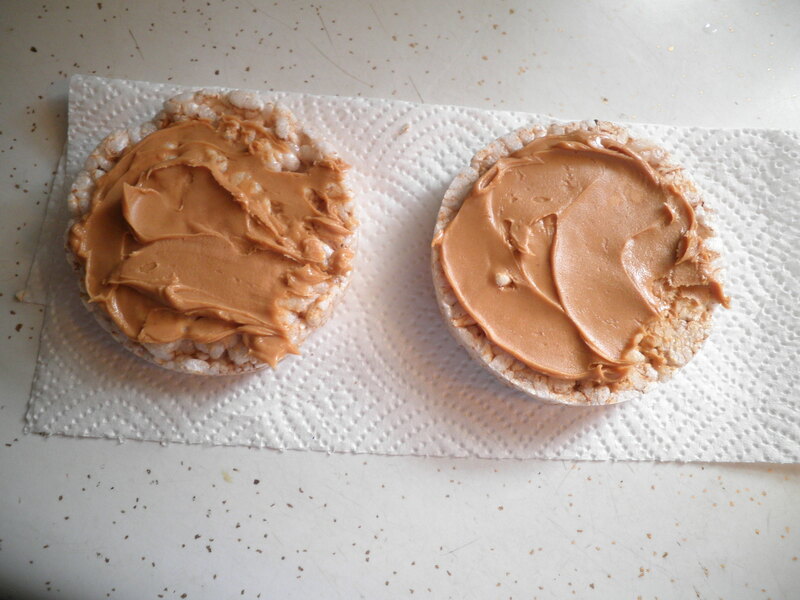 One of my favorite meal/snacks…rice cakes with peanut butter. Tasty, filling, protein and good fats! Another salad about to be spruced up by some home-made dressing! I just love doing this now. Only takes a minute and it tastes so good, so much better than bottled dressing!! Have a great day and when you’ve had your fill here, be sure to visit Peas & Crayons leave some comments and Enjoy!! Happy What I Ate Wednesday!! Have a Snack!! This entry was posted in Uncategorized and tagged OOIAJ, salads, WIAW, yogurt. Bookmark the permalink. you’re off to a great start with the snacks, fran! 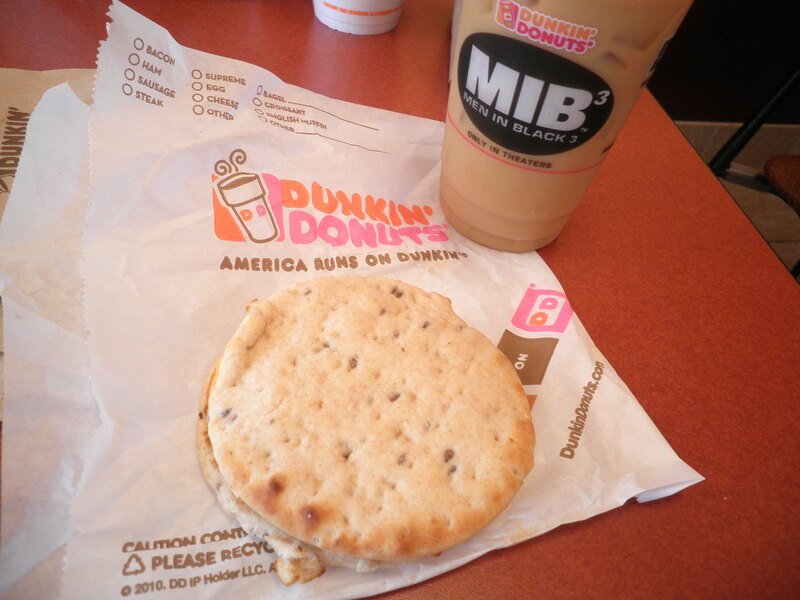 i esp like the rice cakes + pb. is there anything pb is NOT tasty with??! i like to freeze yogurt (greek or regular) with 1 T choco chips sprinkled on the top, then partially thaw in the micro when ready to eat – yum! thanks for including a BPB photo!! 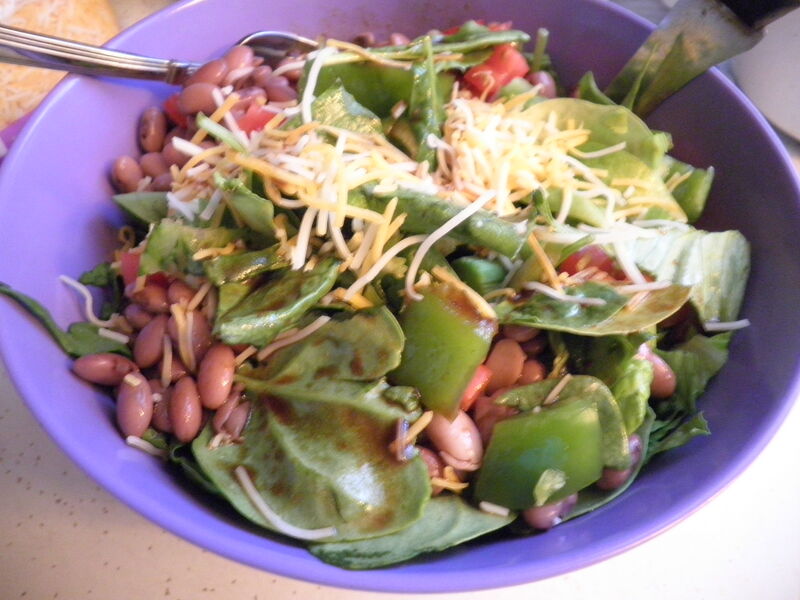 yes, i have to say a salad in that bowl falls into meal category!! Cathy, I like the freezing yogurt idea! I used to do that with a mixture I used to make, but haven’t done it in years. Sounds like I need to do it again! Have a great day! Your breakfast looks amazing! I’ve just snacked on a couple of rice cakes with pb too! That breakfast was So good, Laura! I love PB on rice cakes as a lunch when I’m hungry but don’t feel like making any more effort. It’s quite filling! I think your snack choices are great so far! I usually have greek yogurt for a snack too, and also anything with a nice balance of nutrients for satiety sake! Sounds good to me, Tessa! The greek yogurt is really good for me as a snack…as you say, I’m always satisfied after having it. Always, always, I enjoy your posts. Sorry that I’ve been absent for the past few weeks. Glad you’re back, Marie. I need to get caught up on Lillith’s adventures! Doris, I have that problem too. It just tastes so good, I tend to gulp it! pb makes everything better! 🙂 so good! i’m even loving it on egg whites recently! Hmmm…PB on egg whites? It could work!! Because as you say…it makes Everything better! I had Cheezits for breakfast. Jayne, Jayne, Jayne…I’d actually rather have the Cheezits! They’re one of the things I stay away from due to lack of control…all the really tasty things give me a hard time! Yummy! Looks like some delicious choices! 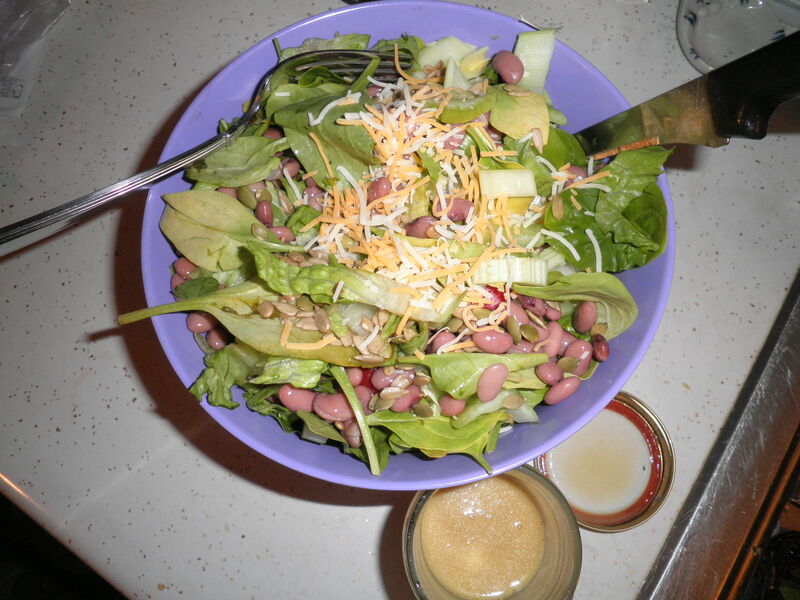 Would love to know what your favorite homemade dressing is–I want to start doing more of that! Stacie, I’ll give a basic recipe tomorrow…how’s that for a deal?! Allie, my girl, we have to find joy in our lives where we can!! I would be excited to be in NYC but with the addition of DD after a dry spell…well that’s just heavenly!! Hope you have wonderful things planned and have a great time! I need to try those overnight oats. Looks delicious! Thanks, Kat and thanks for stopping by. Simple is good sometimes! Please visit again! Hey, Mass! I love rice cakes plain too. Have you ever tried the caramel flavored? Those are great! Hi Lauren, thanks for stopping by! Glad you like the name…please visit again! I’m always cooking up something! I love that you’re thinking about your meals as adaptable, and not just “this is a snack” or “this is definitively a lunch.” Ver inspiring! Thanks, Becks! That’s just the way I’ve learned to work my version of Weight Watchers. Guess it works because I’ve been at or below goal for 25 years! Thanks for stopping by and please visit again! Hi Jennifer!! Thanks, I just love WIAW!! Yeah, I’ve been busy with my injured chicks. Will you be at the next meeting? That’s this Sunday, right? I’m going to try! No, I’ll be at the writer’s conference in Philly, but check and see if this meeting is still on and not cancelled. I have a feeling it was. Thanks, Marie…I RSVP’d yesterday and didn’t get a cancellation notice. I’ll try to contact someone to see. So excited for you to be going to the conference! I went once a long time ago and I’ve always wanted to go back. Have a great time!! Thank you. I’ll let you know all about it. I think so too. Thanks for visiting, please stop by again!